The new movie The Amazing Spider Man 2 is looking really great, as you can tell from the trailer below. Mind on Movies wants to give you a chance to win a prize pack (pictured above). This way when you go and see The Amazing Spider Man 2, you will go in style. This guide is great for parents and children. It will help them with questions they may have during the movie The Amazing Spider Man 2. If you are able to get a chance and go over this with your kids, it would be a great idea. 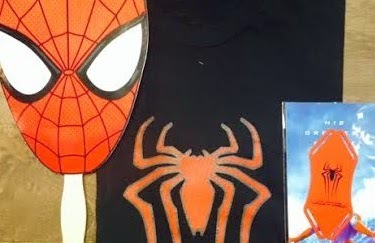 The Amazing Spider Man 2 is to release on May 2, 2014. Disclaimer: Only one entry per mailing address per giveaway. The prize will be sent via FedEx or UPS. No P.O. Boxes please. This contest is from Mind on Movies working with Propeller, LLC. The entries will be checked. You must do what it says to enter the contest to enter to win.